We must use asana to stabilize the body and mind to prepare ourselves for the more refined levels of yoga. Stability increases with consistent practice, determination and dedication. Once we reach stability on all levels, only ease and presence remains. Patanjali states, “posture is when effort ceases and meditation on infinity occurs.” (Sutra 2.47) What is this immersion into infinity? Infinity is the divine light, pure joy or spirit that lies deep within you; it is essentially who you truely are. Patanjali describes this infinity as Ananta. Ananta is universal consciousness. Interestingly enough, Ananta is another name for the mythological, thousand headed serpent king, Adishesha. He guards all of earth’s divine treasures. His thousand heads symbolize Jnana (knowledge) and omnipresence. Adishesa also serves as Vishnu’s bed or couch according to Hindu mythology. This is of importance because he is often depicted sleeping. Vishnu is the preserver of the universe in the Indic trilogy of Gods. He restores moral order (dharma) and embodies vastness. 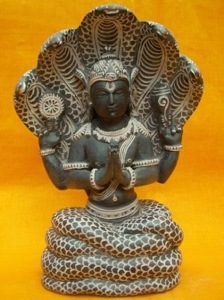 Vishnu also represents our individual self (Atman). Ananta/Adishesha, his bed, is seen as the perfect yogi. He unites the opposing forces of sthira (strength) and sukham (ease). This perfect union of opposing qualities allows Ananta/Adishesha to always embody and practice true posture or asana. Many yogis bow to the great Guru, Ananta/Adishesha/Patanjali before yoga practice. This is why we chant Vande Gurunam before practice in the Ashtanga yoga tradition. We thank our thousand headed serpent guru for giving us the tools (the practice) that brings stability, happiness and light into our lives. of the ignorance of conditioned existence.